Prior to The Carnival of Oppressed Feelings, we organize a 5 Day Program. The purpose of the 5 Days Program is to initiate dialogues and discussions around five themes that are connected to a party (in a political sense). We invited professionals who work with these themes to participate and asked several refugees to talk about their experiences. Next to that, refugee organizations will invite people from their network. This creates a new gathering of experts and refugees every day. 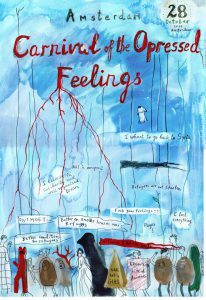 The input provided by the involved parties will be transformed into costumes and theatre props, to be presented at The Carnival of Oppressed Feelings. The Utopian Unemployment Union of Amsterdam (UUUA) is an overarching concept in which Gluklya develops different projects that bring together migrants, artists and institutions in the collective aim of developing a pilot model for a new type of artistic production at the junction of art, economics, progressive pedagogy, social sciences and activism. TAAK is co-developing the Utopian Unemployment Union of Amsterdam. 10:15 - 11:15 - performative tour along a number of locations in Lola Lik where you can admire Gluklya’s work from the past year. This makes her involvement and share in the refugee debate visible through drawings and costumes. Moreover, the tour serves as the starting point of the conversation. You can find photo's of the 5 Day Program on Flickr.